RCA could not accept the fact that they let the Odyssey slip through there fingers (Ralph Baer the designer of Odyssey approached RCA with the deal first), and into the hands of there TV rival Magnavox. The RCA Studio II was their answer to the Magnavox Odyssey. Released in 1976 a few months after the release of the Fairchild Channel F, it would have been the first programmable console (Fairchild beat them to the release gate). The RCA Studio II should have been a color console, a few games were designed for color, but the video output of the console was black & white. 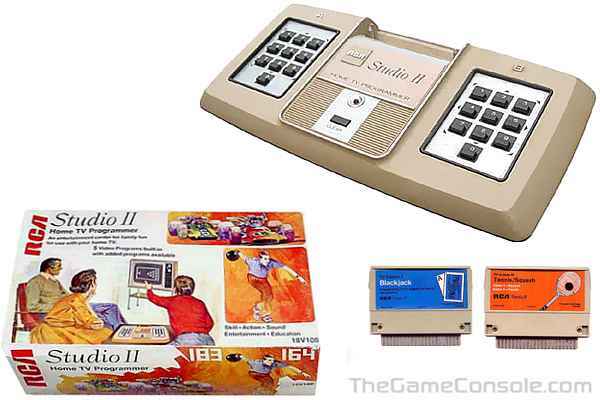 A Studio II clone released in the UK called The Sheen M1200 was released in 1978, and produced PAL color with RCA Studio II games and was a more successful unit.